Any of the various mostly epiphytic tropical plants of the family Bromeliaceae are known as bromeliads. They usually have long stiff leaves, colorful flowers and showy bracts. Many people are surprised to learn that bromeliads include the pineapple and spanish moss. All bromeliads are originally native to the New World but many have been introduced into tropical locations worldwide. Most bromeliads produce an inflorescence that is comprised of a showy bract with several flowers. These flowers can be very fragrant in many species including the common Spanish Moss. Many bromeliad species have large leaf axils and funnels which can hold a considerable amount of water. These small bodies of water act as mini aquariums and are used by many species of frogs to rear their tadpoles. As a result many arboreal frog species spend their entire lives in the rain forest canopy never coming to the ground. 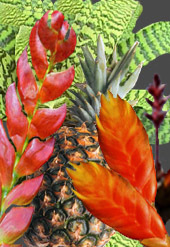 Browse through our Bromeliad selections below and click on any image to see a close up. Check our latest Ebay auctions.